A sample workout could be 20-60 seconds of classic exercises (think squats, jumping jacks, and push-ups) with a 10-second rest in between sets. The sets are repeated any number of times, but the workout never exceeds 30 minutes. In fact, you can get a full body workout in as little as four minutes. HIIT workouts are not only effective, but are also quick, free, and you don't have to leave the house. Here are a few great routines to try out. 1. Straightforward HIIT Workout. No video is needed for this straightforward workout that you can really do anywhere. This is my too-tired-to-think fallback routine, thanks to the basic movements I remember by heart after many, many rounds. 2. World's Fastest Workout (4 Minutes). This four-minute workout gets the job done before your brain can even register it's exercising and hates it. I like to crank this one out while the kids are zoning with the iPad -- sometimes twice if I'm feeling ambitious. 3. 12-Minute Lean & Tone Workout. Twelve minutes of exercise is totally doable during nap time or before you fall into bed. I use five pound dumbbells for this workout, though the trainer uses ten pound weights. If you don't have dumbbells, use large canned goods from your pantry, or a full 12-ounce bottle of water. 4. 15-Minute At-Home Workout. Perform each exercise at high intensity first and then regular intensity to fire up your metabolism ASAP. I use the stopwatch on my phone to keep track of time. 5. 30-Minute Body Weight Workout. I printed this routine out to ensure I performed the moves correctly. This detailed HIIT workout is 30 minutes long but will burn major calories using only your own body weight as resistance. Totally doable right? 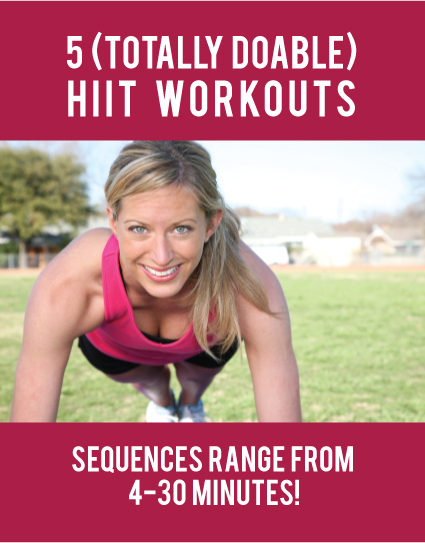 Have you tried HIIT workouts? Share your thoughts or favorite routines in the comments below!